I share my home with five pets: two dogs, and three cats. They are all adorable, and they can all be monsters at times. Working from home with pets – while having plenty of advantages – has had a few disadvantages as well. The dogs – Isley and Sawyer – adapted well to working in my office. They have three different beds that they rotate between, and I give them chews and/or treats whenever we start work for the day, so they’re usually asking me to go into the office. Then they mostly relax all day, but occasionally ask for attention or to play, which I usually need just as much as they do. Two of my three cats have no interest in going into the office with me. They have their own plans for the day that involves doing whatever they want whenever they want. But my third cat, Squeak, is a needy baby. 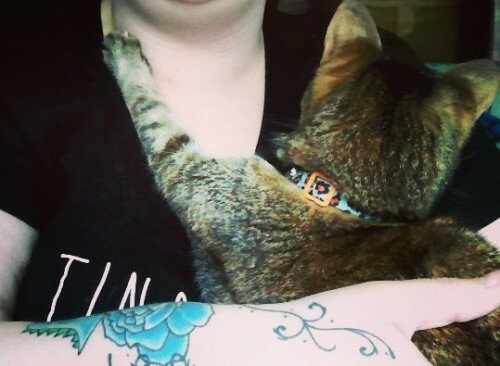 She’ll be six-years-old this month, and while she’s always been clingy, she used to be able to handle me going to work without her. Now, for some reason, she can’t stand it, and she howls at the door until I let her in. Which wouldn’t be so bad, except that when she gets in here, she just demands my attention and meows at me. This is me working, typing one handed, because it was the only way I could get her to be quiet so I could work. And this is her from earlier this week, when I was at my wits end. She would howl if I left her out (and she has THE loudest, most obnoxious meow I’ve ever heard from a cat), and she would meow and demand attention if I let her in. After six months or so of dealing with this, I didn’t know what to do, and I couldn’t take it anymore. I loved Squeak to death, but I was losing my mind. 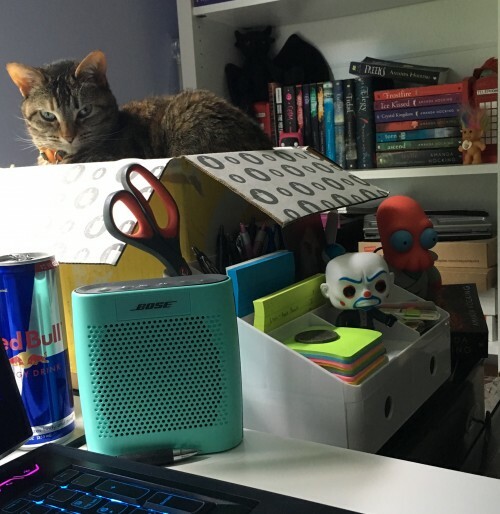 Then I remembered something on the internet that claimed if your cat is bothering you all the time at your desk, put a box on your desk. Could it really be that simple? The answer is yes, yes, it can really be that simple. We’ve been doing this for a few days now, and it has been AMAZING! 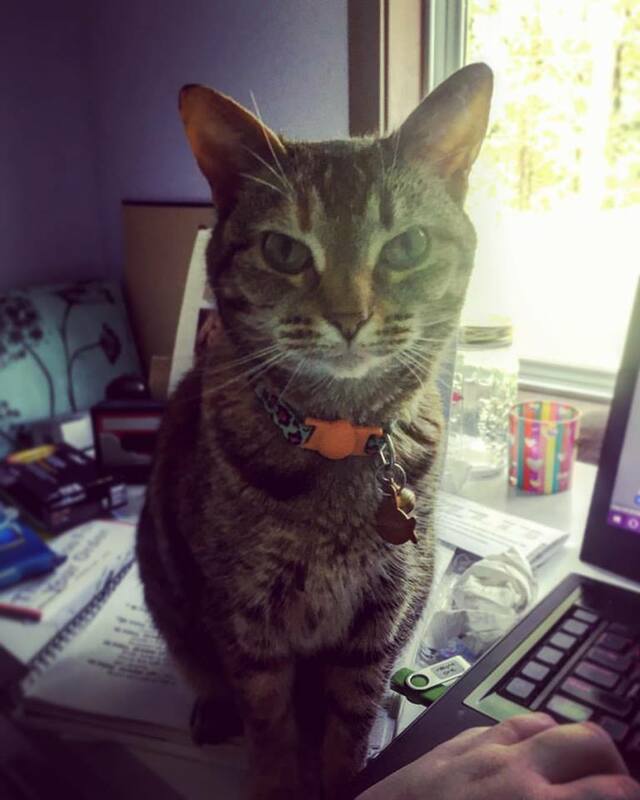 She comes in with me at the beginning of the day, and I pet her for a couple minutes, then I put her in the box where she lays down and sleeps contentedly the rest of the time I work without meowing or demanding attention or anything. The box I put her in has some random junk in it with a neck pillow on top, so I think it’s actually like a cat bed within a box, and she’s able to sit up a bit higher so she can look around, which she loves. But it has been a real life saver. I think both Squeak and I were pretty unhappy with the situation. So if you, like me, are you going crazy trying to work with cats, give a box on the desk a try. 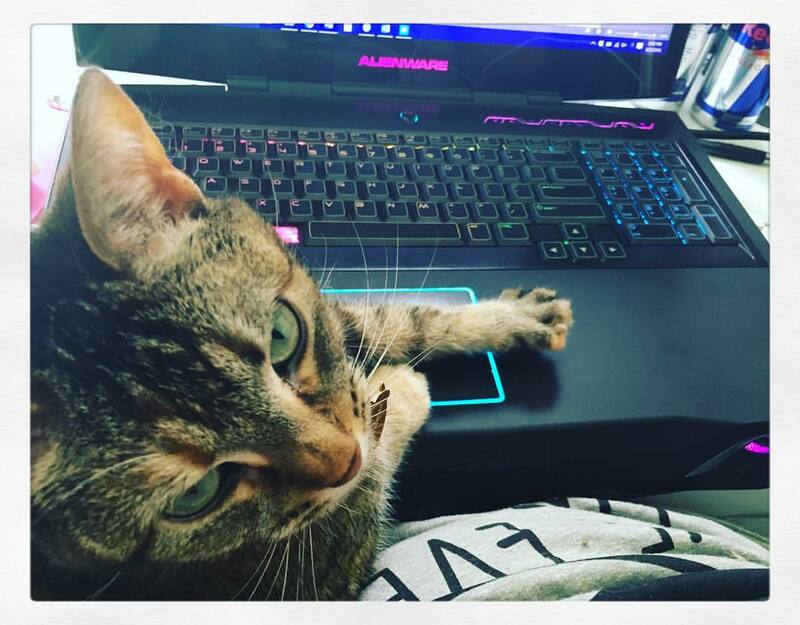 My kitty Penny wants to crawl on me when I am working with my laptop. Typing one handed, YUP! I try to push her higher up, so that she is resting on my shoulder. Gotta love our fur babies! Love this idea I am glad that works for you!